^ Ben Kenigsberg (31 August 2017). "Review: In 'Viceroy's House,' the Birthing Pains of Two Nations". The New York Times. Retrieved 9 October 2017. ^ Stephanie Merry (7 September 2017). 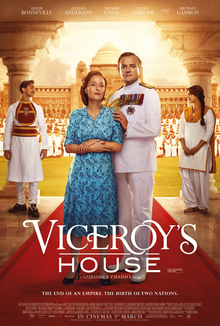 "'Viceroy's House': An educational, if melodramatic refresher course on the partition of India". Washington Post. Retrieved 9 October 2017. ^ Ian Jack (18 March 2017). "The Viceroy's House version of India's partition brings fake history to screen". The Guardian. Retrieved 9 October 2017.